Almost everywhere I’ve lived — Pittsburgh, Cincinnati, Chicago — has been home to an IKEA, but it’s never been “I’ll just swing by on the way home from work” close. It’s always far enough to require a special outing — an Epic IKEA adventure. London is no different. For my birthday this year my parents got me an awesome present — an IKEA gift card in £. I have no idea how they procured it — it involved phone calls, international transactions, and the Royal Mail sending it to Kentucky — but it made its way back across the pond with me and was burning a hole in my pocket. I was behind on work from my jetlag, yet every time I would start working on something, a voice in the back of my head would say, “I wonder if IKEA sells a steamer insert. You should probably go on their website and check.” And then an hour later I have a steamer insert on my virtual shopping list, along with 10 other things. This went on for days. Clearly, the only way to stop it would be to have an epic IKEA adventure and buy all the things. So that’s what I did yesterday. Getting to IKEA was easy enough. I rolled my shopping trolley to the overground station, arriving just in time for the train, got off at Stonebridge Park, and took the free IKEA shuttle to IKEA Wembley. 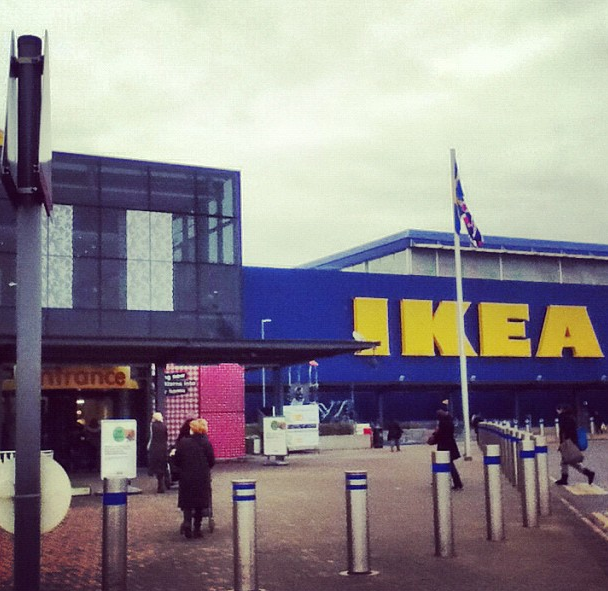 In minutes I was at the Mecca of cheap Swedish furniture and other random household goods. In a way, IKEA is like the Vatican Museum. Most people only want to see the Sistine Chapel and the Vatican knows this. But if they charged €5 just to see that, no one would pay the €16 to go through the whole museum. So they make you wander for hours through the entire museum (sometimes in wet socks and shoes) before they let you see Michelangelo’s masterpiece. There are no shortcuts either. Every so often they’ll put up a sign letting you know you’re going the right way, but you’re a long way from the main event. That’s how I feel about IKEA’s showroom. Everything on my list was in the marketplace, but they don’t let you go right there. They make you walk through the entire showroom, through bedrooms, baths and kitchens, with signs promising you you’re almost to the haven of cheap dishes and candles. I guess they’re counting on you buying something just because it looks good in the fake bedroom — if it was just in a bin in the marketplace, you wouldn’t pick it up. They even have little bins of products spread throughout the showroom. I fell for this trick when I first walked in, but I soon realized everything was also in the marketplace, and with more variety. By the time I finally made it through the showroom I had wasted a good half hour. With my list from the website in hand, I picked up everything I needed (and more) and made it to the warehouse part. The only thing I needed there was the famous cheap Lack side table that every apartment must have. We already have two of them, but recently bought a printer and were storing it on top of my keyboard bench, so we needed another table. I was going to have this delivered, but in true Renee fashion wanted to save the delivery fee and figured I could carry it. It’s only a little side table! I brought my largest tote bag, foolishly thinking it would fit. I think someone behind me laughed when they saw me try. I experimented carrying it in one hand around the store. Now this table was easy to carry in the way that high heels are comfortable when you first try them out around the store. With my eye on the clock, I checked out, using up all but £7 of my gift card on pots, plates, storage bins, utensils, a steamer insert, whatever the Swedish word is for “whopper chopper” and of course that side table. I made the shuttle just in time (time was really on my side during this adventure) and was dropped off back at the Tube station. The Tube station I did not realize was at the top of three flights of stairs, because my trolley was empty when I arrived and I wasn’t carrying a table. But now I was. I went up each step slowly, taking a step, moving my cart up, cursing the stupid table. I finally made it with a minute to spare. 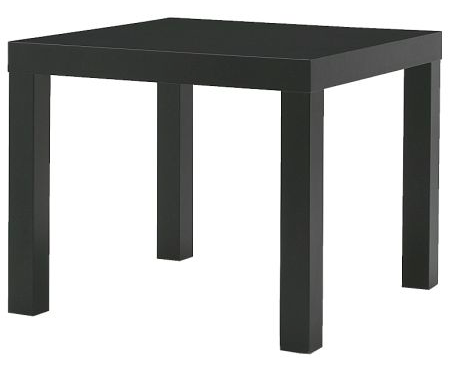 Realizing that this table was not as comfortable to carry as I thought, I decided to be smart and take the Tube to Baker Street, then take the 274 bus that goes right by my apartment to minimize my walking. It was a long ride to Baker Street on the Bakerloo line, but the time passed quickly because there was a cute British kid sitting next to me who said cute British things. I didn’t even care that he spent the whole ride kicking my table, because honestly I wanted to kick the table too. When we arrived at Baker Street station, I followed the “way out” signs, thinking I was home free. And then I saw the stairs. I did not know there would be stairs, as I never get off at Baker Street, and my Tube station only has escalators. I begrudgingly began my step-pull routine when a woman came up behind me. “Need any help?” she asked. I lied and told her I was fine, because that’s the polite thing to do. “Are you sure?” she asked, watching me struggle. We then had what can only be described as a polite off, as she continued to offer help and I continued to insist I was OK, until finally she lifted the bottom of my trolley and suddenly I could walk up the stairs at a normal pace. I thanked her profusely, knowing that this was the perfect occasion to say “cheers,” but it just doesn’t sound right in an American accent. She walked on ahead of me as I turned a corner to encounter — you guessed it — more stairs! Side note: how are so many Tube stations not accessible? What about people with disabilities, the elderly, and those carrying trollies and tables who would greatly benefit from a lift? This time a well-dressed man came up behind me and offered help. The table digging into my fingers, I didn’t even bother with a polite off. He helped me lift my trolley up not one, but two flights of stairs. Kind people of Baker Street station, I can’t thank you enough. Finally out of the station and on the main road, I once again thought I was home free, as the bus stop is right in front of the station… until I remembered that Baker Street is a one-way going south, and I needed to go north. To catch the northbound 274 bus I had to go over one block. This is when the metaphorical heels started giving me blisters. That table I thought was so easy to carry in the store was killing me. I was almost to the stop when I saw the bus coming down the street. The 274 never seems to come often, so I had to catch that bus. I don’t want to say I ran into oncoming traffic with my trolley and table in order to make the bus because I know my parents and grandparents read this, so I’ll say I patiently waited for the walk sign and crossed the street when appropriate, not at all running or risking the poorly packed dishes in my trolley (all of us survived, by the way). Since this story is already too long, I’ll just say that I eventually made it home with my IKEA haul, I would definitely go back to IKEA Wembley, but I am not buying a table unless we drive.